Miscarriage is defined as the premature loss of pregnancy occurring so early that the embryo or fetus is not viable outside the womb, up to about 23 weeks’ gestation (Mutiso, Murage, & Mukaindo, 2018). Miscarriage is the most common early pregnancy complication, occurring in approximately 15%–20% of known pregnancies, and is usually caused by chromosomal abnormalities in the embryo or fetus (Bardos, Hercz, Friedenthal, Missmer, & Williams, 2015). The estimated rate of loss for both known and unknown pregnancies is 20%–50% (Markin, 2017). Risk of miscarriage declines as a pregnancy progresses, with most occurring in the first 13 weeks of gestation, and 75% occurring in the first 17 weeks (Mutiso et al., 2018). Many women and couples are unaware of the high incidence of miscarriage until, or even after, they experience one (Bardos et al., 2015). In a recent survey assessing public perception of miscarriage in the United States, most participants were mistaken in their beliefs about both the prevalence and causes of miscarriage (Bardos et al., 2015). This widespread misinformation is related, at least in part, to powerful cultural norms of silence around the premature loss of a pregnancy (Markin & Zilcha-Mano, 2018). Despite societal taboo and minimization obscuring both prevalence and impact, approximately one out of every four women will experience a first trimester miscarriage (Wallace, Goodman, Freedman, Dalton, & Harris, 2010). As such, counselors are likely to work with clients who have encountered this specific type of loss. Women vary in their responses to miscarriage (Trepal, Semivan, & Caley-Bruce, 2005). Some women feel relief upon learning that an unplanned pregnancy will not continue (Wallace et al., 2010), and others consider miscarriage a minimal obstacle to overcome (Engelhard, 2004). Bardos and colleagues (2015) reported that women who had personally experienced miscarriage and men whose partners had one endorsed feelings of guilt (47%), having done something wrong (41%), isolation (41%), and shame (28%), as well as a belief they could have done something to prevent the loss (38%). Multiple factors influence a woman’s reactions to miscarriage, including how she experienced and ascribed meaning to the loss, her level of psychological distress prior and subsequent to the event, and variables within her environment (deMontigny, Verdon, Meunier, & Dubeau, 2017; Engelhard, 2004; Engelhard, van den Hout, & Arntz, 2001; Shreffler, Greil, & McQuillan, 2011). Many women experience grief after miscarriage (deMontigny et al., 2017; Randolph, Hruby, & Sharif, 2015; Trepal et al., 2005). Half of women grieving after pregnancy loss report clinically significant psychological distress, most commonly manifested as anxiety or depression (Randolph et al., 2015). Of the 30%–50% of women who experience severe symptoms in the 6 months after a pregnancy loss, most can still be described as grieving, and their symptoms often decrease over time (Engelhard, 2004). Identifying those women who are at high risk for intense psychological distress is important in order to facilitate assessment and treatment (Hutti et al., 2018). Predictors of acute and persistent symptoms of depression and anxiety after an early pregnancy loss include pre-existing mental health diagnoses, childlessness, and dissatisfaction with health care received (deMontigny et al., 2017). Given the prevalence of miscarriage and associated risks to psychological well-being, as well as the cultural norms that may influence both clients’ and counselors’ willingness to acknowledge this type of loss as significant enough to warrant assessment and intervention, mental health professionals are advised to seek out knowledge and strategies to inform their work when they encounter clients who are struggling after the loss of a pregnancy (Markin & Zilcha-Mano, 2018). The aim of this article is to provide a clinically salient and practical overview of the current literature for practitioners, educators, and researchers, as well as to suggest a conceptual lens that may counter counselors’ own assumptions about miscarriage and through which multiple germane variables influencing the client can be seen. In the following sections, we: (1) highlight the dearth of counseling-specific scholarship focused upon early pregnancy loss, (2) briefly review recent practically applicable clinical literature, and (3) describe the relevance of Bronfenbrenner’s ecological model (1979, 1994) as a conceptual tool for counselors seeking to account for multiple systemic factors that may be at play when working with clients who are experiencing psychological distress after miscarriage. We then (4) apply this ecological conceptualization strategy to a case example, demonstrating how one woman’s miscarriage is an important life span event influenced by numerous variables—developmental, relational, cultural, political, and economic. Cultural silence regarding pregnancy loss is noted by multiple authors (e.g., Engelhard, 2004; Markin & Zilcha-Mano, 2018; Randolph et al., 2015; Trepal et al., 2005), and this reticence extends to the counseling literature as well. Our search for the word “miscarriage” in 25 peer-reviewed journals specific to the counseling profession revealed only six articles published in the last 20 years (from January 1, 1998, to August 7, 2018) in which there was more than an incidental mention of the term. A recent qualitative study examined fathers’ lived experiences of miscarriage (Wagner, Vaughn, & Tuazon, 2018). Randolph and colleagues’ (2015) review focused on counseling women who had experienced pregnancy loss; they identified six themes in the literature (silence, grief, psychological distress, the role of social support, satisfaction with health care, and coping strategies) and noted the paucity of counseling scholarship on this topic. Another article discussed grief associated with pregnancy loss, particularly as related to work with infertile couples who had experienced recurrent miscarriages (Stark, Keathley, & Nelson, 2011). Betz and Thorngren (2006) explored family grief around ambiguous losses, with miscarriage mentioned multiple times as an example of such; they described a family counseling model that includes defining the loss, accessing coping resources, and creating a meaningful narrative of the event. Trepal and colleagues (2005) offered an empathy-infused overview of the topic, including conceptual and developmental perspectives and case-specific examples of diverse reactions to this type of loss. Sperry and Sperry (2004) presented a brief review of the literature as related to medical and psychological aspects of miscarriage and ectopic pregnancy, as well as a case example illustrating a therapeutic approach with a married, heterosexual couple who had experienced early pregnancy loss. It is noteworthy that four of the six miscarriage manuscripts that were selected for publication by counseling journals did not focus specifically on women clients, instead examining families (Betz & Thorngren, 2006), heterosexual couples (Sperry & Sperry, 2004; Stark et al., 2011), and male partners’ experiences as part of such a couple (Wagner et al., 2018). Only three of the six focused on miscarriage specifically (Randolph et al., 2015; Trepal et al., 2005; Wagner et al., 2018). The limited literature on this topic can be viewed as a systemic barrier to the development of clinical competence related to pregnancy loss—an isomorphic reflection of the lack of awareness, customs, conversations, and resources related to the experience of miscarriage in our culture. In the next section, we seek to begin to address this gap in the counseling literature by offering a brief review of empirical and conceptual scholarship relevant to counselors working with clients who are struggling after pregnancy loss. As previously mentioned, women vary in their responses to miscarriage, which may include relief that an unwanted pregnancy is over, resilience in the face of a setback, or deep sadness at the loss of a child (Engelhard, 2004; Trepal et al., 2005; Wallace et al., 2010). Although grief following early pregnancy loss mirrors other grief responses in intensity and duration, it is unique in its focus on the demise of an anticipated future rather than on memories of the past, leaving the griever to create a narrative of this ambiguous loss (Betz & Thorngren, 2006). Feelings of guilt, isolation, and shame are common (Bardos et al., 2015), exacerbated by cultural taboos regarding the expression of perinatal grief and related responses of minimization and dismissal by others (Markin & Zilcha-Mano, 2018). Such taboos and responses are reflected in multiple ecological systems. Historically, the ability to reproduce has been a measure of women’s worth; this, along with the fact that pregnancy loss can be a physically and psychologically disturbing event, may contribute to the long-standing taboo, silence, and a lack of scripts around miscarriage in many cultures and settings (Burnett, 2009; Engelhard, 2004). In light of this, women and couples may struggle to find both outlets to process their stories and resources for coping with the physical, mental, relational, and spiritual dimensions of their loss (Betz & Thorngren, 2006; Randolph et al., 2015; Trepal et al., 2005), highlighting the need for counselor competence in this domain. Findings from Shreffler and colleagues (2011) support a “social constructionist approach” (p. 353) to understanding the psychological impact of pregnancy loss. Their research showed that women’s beliefs about motherhood, their fertility, and loss; their current desire for a baby; whether or not their lost pregnancy was planned; whether or not they subsequently gave birth to a child; and time since the loss were significant predictors of distress—in other words, a woman’s experience and understanding of her miscarriage within her unique environment is related to her ability to cope with her loss. There are subsets of women for whom miscarriage is the catalyst for serious and persistent mental health symptoms (deMontigny et al., 2017; Engelhard et al., 2001; Hutti et al., 2018; Shreffler et al., 2011). Markin (2017) reported that 15%–30% of women have major psychological difficulties after losing a pregnancy and that 10% of these reactions may be classified as diagnosable, including anxiety disorders, depressive disorders, acute stress disorder, substance use disorders, and post-traumatic stress disorder (PTSD). Women already struggling with mental health concerns before their miscarriage, women without living children, women who were dissatisfied with the health care they received related to their pregnancy loss, and women who were traumatized by their miscarriage can be more vulnerable to persistent symptoms (deMontigny et al., 2017; Engelhard, 2004; Engelhard et al., 2001; Shreffler et al., 2011). The primary foci of most investigations of the psychological impact of miscarriage are depression and anxiety, and studies often do not include trauma-specific assessments (deMontigny et al., 2017; Hutti et al., 2018; Shreffler et al., 2011). Some women, however, are traumatized by the experience of miscarriage: physical pain, distressing amounts of blood and tissue, emergency medical interventions, doubts about future fertility, insufficient support within their microsystem, and the unexpected and unexplained loss of a future child (Engelhard, 2004). The experience of pregnancy loss can represent the devastating demise of a nascent primary relationship with associated destabilizing effects (Markin & Zilcha-Mano, 2018). Some women who have a miscarriage—especially those with higher neuroticism, lower emotional regulation, more negative life events, and who experience dissociative reactions to the event—may meet criteria for PTSD (Engelhard, 2004). In a prospective longitudinal study of PTSD and depression after loss in any stage of pregnancy (including both miscarriages and stillbirths, the latter of which is much rarer and holds a much greater risk for trauma), 25% of participants met criteria for PTSD one month after pregnancy loss, dropping to 7% after four months (Engelhard et al., 2001). A study by Engelhard and colleagues (2001) is particularly noteworthy for its inclusion of qualitative, first-person participant accounts of both miscarriage and stillbirth. These descriptions offer a window into the potential traumatic nature of such experiences—shedding light on both the stories themselves and the possible origins of cultural taboos around this topic. Such stories underscore the need for timely, sensitive interventions for some women, perhaps similar to work done with individuals who have closely experienced disaster or assault. Meeting diagnostic criteria for PTSD was associated with persistent depressive symptoms after pregnancy loss (Engelhard et al., 2001). This result raises questions as to whether women who were identified as having higher than average levels of depression and anxiety in other studies were experiencing a post-traumatic response. Even when not meeting the diagnostic threshold for PTSD, women may experience trauma-specific symptoms such as re-experiencing, hyperarousal, and intrusive recollections (Engelhard et al., 2001). Diagnosis and treatment planning for women experiencing severe distress can be improved by pushing through cultural norms of silence and minimization and fully assessing clients for trauma responses. The amorphous psychological vulnerabilities associated with miscarriage exist alongside concrete biological ones; the loss of a pregnancy is, at least in part, a medical event. When appropriately managed, the physical risks of miscarriage are relatively low (Wallace et al., 2010). The first stages occur inside a woman’s body without her immediate knowledge. Quickly, however, there are interpersonal and ecological variables that begin to influence a woman’s experience (Trepal et al., 2005). Bleeding or pain may be the first sign; some women present in the emergency room with these symptoms and find out about both their pregnancy and impending miscarriage at the same time (Wallace et al., 2010). Women may learn that a pregnancy is non-viable at a prenatal medical appointment, based upon routine bloodwork or ultrasound scans. Medical professionals may not receive adequate training about working with patients who are experiencing pregnancy loss. Among a sample of third-year medical students, less than 25% had observed a physician deliver news about a miscarriage during their obstetrics and gynecology rotation (Marko et al., 2015). The high cost of medical care, particularly when not openly discussed with patients, might be another source of marked distress (Ubel, Abernethy, & Zafar, 2013). Culturally condoned minimization of miscarriage can manifest in multiple interpersonal interactions, including those with health care providers, and leave women isolated and disenfranchised in efforts to cope with their loss (Markin & Zilcha-Mano, 2018). Satisfaction with health care was identified as a theme in the literature on early pregnancy loss (Randolph et al., 2015), and dissatisfaction with the health care received during and immediately after a miscarriage predicted atypically persistent psychological distress more than 2 years after the event (deMontigny et al., 2017). This finding is particularly important for counselors, as the nature of clients’ previous interactions with health care providers may not emerge or be noticed as potentially pertinent in standard biopsychosocial assessments. Dissatisfied patients cite providers’ attitudes and failure to convey awareness, empathy, compassion, information, and suggestions for follow-up related to the emotional impact of the loss (Geller, Psaros, & Kornfield, 2010). Despite the large number of women impacted by miscarriage and its effects, a shortage of published clinical research in this domain across disciplines has been noted (e.g., Markin, 2017; Randolph et al., 2015). Many existing studies lack empirical or theoretical rigor (e.g., exclusive focus on only certain symptoms, use of very brief interventions that may or may not be performed by trained mental health clinicians, lack of longitudinal follow-up). Our societal classification of miscarriage as primarily a medical matter contributes to a scarcity of psychologically focused scholarship regarding how to fully support women during and after the multi-faceted experience of losing a pregnancy (Markin, 2017). Counselors without specific training focused on awareness of miscarriage and ways to intervene with clients experiencing distress related to it can inadvertently neglect this area in their psychotherapeutic work (Markin, 2017). Engaging in a systemically informed approach to learning about and conceptualizing this highly prevalent life span event is one way to combat cultural silence regarding pregnancy loss. Bronfenbrenner’s (1979, 1994) ecological systems model is firmly situated within the psychological and developmental canon and is a powerful foundation from which to explore and develop systemic thinking skills in students, professionals, and clients. In it, a series of ever-broadening environmental systems influence the development and functioning of individuals (see Figure 1). Some factors related to resilience and distress originate in or are exacerbated by variables in distal systems (meso-, exo-, macro-, and chronosystems); counselors who share these complexities with their clients may help lessen self-directed attribution leading to blame, shame, and guilt (Rogers, Gilbride, & Dew, 2018). Counselors who utilize an ecological approach to understanding clients are less likely to ignore or minimize the many complex and nuanced variables that may influence clients’ experiences related to miscarriage. During a time in which she may have just begun to grapple with the physical, emotional, and existential ramifications of her pregnancy (e.g., wanting or not wanting the pregnancy, nausea, soreness, fear, joy, what it means to become a mother, plans for the future), a woman who is miscarrying is suddenly beset with biopsychosocial ramifications of loss (Engelhard et al., 2001; Trepal et al., 2005). Awareness, understanding, and exploration of the multiple systemic influences in women’s stories of miscarriage are inherent in an ecological conceptualization of this topic. Williams, McMahon, and Goodman (2015) used ecological systems (Bronfenbrenner, 1979) as the foundation for a pedagogical intervention called eco-webbing, which is intended to develop counseling students’ critical consciousness through the creation of a visual representation of systemic influences in their clients’ lives. Resilience researchers Ungar, Ghazinour, and Richter (2013) expanded upon the traditional nested ecological model through the introduction of the idea of differential impact. This concept suggests that the importance of a given variable is not predicted by its closeness to the individual at the center of Bronfenbrenner’s model; rather, variables existing in the outer levels of the ecosystem may be extremely significant to a specific person in a specific context. Drawing upon this, Rogers and colleagues (2018) proposed the use of an eco-map, a visual representation of environmental variables organized both by systemic level and current salience to the client. Clinical relevance is noted by distance to the client at the center of the map and by the size and ordering of variables within each level. The eco-map for a particular client will change over time, with different variables gaining salience while others recede. This strategy for organizing client information may be of particular use to counselors, educators, and supervisors in search of clinical and teaching tools that counter biased assumptions and capture the complexities of current environments (Rogers et al., 2018). Figure 1. Bronfenbrenner’s Ecological Model. During clinical encounters with women who have experienced miscarriage, the importance of acknowledgment and validation is emphasized by authors working from a variety of disparate theoretical vantages (Diamond & Diamond, 2017; Markin & Zilcha-Mano, 2018; Wenzel, 2017). Narrative therapy is one recommended approach (Betz & Thorngren, 2006; Stark et al., 2011), with particular focus on clients’ reproductive story (Diamond & Diamond, 2017; Jaffe, 2017). This conceptual construct integrates exploration of the past, present, and future into work with clients who have experienced a reproductive loss, normalizing and validating both acknowledged and unacknowledged reactions to the loss, as well as making space for the client to create a hopeful narrative about the future. Therapeutic exploration of the meaning of the loss, both to the individual client and within broader relational and cultural contexts, is encouraged in order to facilitate client understanding and growth (Diamond & Diamond, 2017; Markin & Zilcha-Mano, 2018; Wenzel, 2017), supporting the utility of the ecological model as a conceptual frame. Ecological conceptualization pairs easily with a wide variety of theoretical approaches to clinical work. It can be used to facilitate a more deeply person-centered encounter, to provide context for adaptive and maladaptive relational strategies at play both in and out of the therapy room, to facilitate existential exploration, and to co-create goals and strategies tied to specific variables. Counselors can infuse ecological conceptualizations and observations into the therapeutic encounter, providing rich opportunities for reflections of meaning, re-framing, and narrative restructuring. Following a detailed case example describing a client who has recently experienced a miscarriage, the next sections progress through each level of the ecological model (Bronfenbrenner, 1994). After explicating the level, we identify clinically relevant variables from both the literature and the case example and offer clinical implications for counselors working within an ecological framework. An eco-map summarizing ecological variables from the case example can be found in Figure 2. Figure 2. Eco-map of Michelle. Michelle is a 27-year-old woman who lives in a mid-sized East Coast city. She resides with her boyfriend of 3 years, Jon, and is employed as a server at a high-end restaurant. She is currently applying to graduate school to be an occupational therapist. She presents for counseling at a large clinic, asks about sliding scale fees for uninsured clients, and states on her paperwork that she would prefer to see a female clinician, “middle aged or older if possible.” Intake assessments suggest mild to moderate symptoms of depression and anxiety. During the first session, Michelle discloses that she experienced a miscarriage 4 weeks ago. She learned she was pregnant from a home pregnancy test at approximately five weeks gestation, after her menstrual period did not arrive on time. She began experiencing pregnancy symptoms (sore breasts, sensitivity to smells) the next week. When she visited a medical clinic at 9 weeks gestation, pregnancy hormone levels in her blood did not align with the dates of her last period. A transvaginal ultrasound was ordered, and results showed that the embryo had stopped developing at approximately seven weeks, with no visible heartbeat. She was told that the pregnancy was not viable, that she should prepare for “nature to take its course,” and that she should expect to begin bleeding in the coming days. She was told that if she did not spontaneously miscarry in the next week, she would need to undergo a procedure called a dilation and curettage (D&C), during which her cervix would be partially dilated and the pregnancy-related tissue would be surgically removed from her uterus in order to avoid infection and other complications. Michelle described a growing sense of anxiety and sadness upon hearing the news that her pregnancy was not viable. Though she was initially shocked and upset about her unplanned pregnancy, she and Jon had begun to plan for their new identity as a family of three. In the days after her doctor’s appointment, Michelle had two panic attacks—something that had not happened to her since high school. Michelle experienced some painful cramping and spotting one week after her appointment. She called and reported her symptoms, and the nurse scheduled her for a D&C at an outpatient surgery center. She asked what would happen if she did not get the D&C, what to expect from the procedure, and if the D&C posed any risks for future fertility. Her male doctor offered minimal information, stating that the D&C was necessary, that she should not worry, and that the procedure would be “quick, with only mild cramping, if anything.” Jon accompanied her to the surgery center, though per facility’s policies he was not allowed to be in the room during the procedure. She experienced panic symptoms prior to and during the D&C as well as moderately severe pain, and she was reminded of the time in college when she accompanied a friend who got an abortion. In the month since the procedure, Michelle reports a variety of distressing symptoms and situations. Though they were planning a long-term future just weeks ago, she describes a growing distance between her and Jon. He is spending more time going out with friends and does not want to talk about the pregnancy or their relationship. Michelle was unable to work for a week after the surgery, and the missed income is creating short-term financial strain. She reports this would be manageable if not for the multiple medical bills for appointments, labs, scans, and the D&C that are starting to arrive in the mail. Michelle does not currently have health insurance: She was removed from her parents’ plan on her birthday, her employer does not offer benefits, and she has been trying to save money for a few months before starting graduate school and getting a new plan through the university. So far, the bills from the surgery center alone total over $5,000. When the largest of these bills arrived in the mail, Michelle had a panic attack that included chest pain and shortness of breath. During this episode, she convinced Jon not to call an ambulance because of the cost, even though he feared she was having a heart attack. She has also been experiencing inability to sleep, loss of appetite, nightmares, and ruminations focused upon the state of her relationship with Jon, whether she still wants to go to graduate school, whether she could have done anything to prevent the miscarriage, and whether she will be able to have children in the future. She has told a few close friends about her situation, but they are confused about why she is not simply relieved to have the unplanned pregnancy no longer be a hindrance to her educational and professional aspirations. She reports that she is close with her parents but has not told them anything. They already disapprove of Michelle and Jon living together because of their religious beliefs, and she does not want to further complicate her relationship with them. Individual. At the center of Bronfenbrenner’s model is the individual (see Figure 1). There is a great amount of variability among individual women’s experiences of miscarriage. Baseline physical and mental health, presence or absence of physical and psychological symptoms, the length of the pregnancy, whether or not the pregnancy was wanted, number of prior pregnancies, plans for the future, and the physical experience of the miscarriage are just some of the many variables that counselors should be aware of when working with clients (deMontigny et al., 2017; Shreffler et al., 2011). Though Michelle’s pregnancy was unplanned, she demonstrated resilience and flexibility regarding the news and had begun planning for her future as a mother. She may be mourning the loss of this new life and identity (Betz & Thorngren, 2006). Her pregnancy symptoms were caused by shifting hormones; her current physical and psychological symptoms may be influenced by her hormonal levels returning to a non-pregnant state. She has a history of panic attacks from 10 years prior, and this pattern reemerged upon learning that her pregnancy was non-viable. She has undergone a series of invasive medical procedures, including transvaginal ultrasound, dilation of her cervix, and surgical removal of tissue from her uterus, as well as unexpected pain. Michelle’s surprise over her pregnancy, her adaptive response to it, the unanticipated miscarriage, and her resultant novel physiological and medical experiences have coalesced into an overwhelming intrapersonal incident. Conveyance of a caring and nonjudgmental stance around these variables, as well as normalizing her reaction to a series of physically and existentially significant life span events, is essential to creating a clinical space where she can freely explore her unique experience (Trepal et al., 2005). Knowledge on the part of the counselor around what many find to be a taboo topic may serve to both normalize the experience and highlight its uniqueness to this client at this moment in her life. Microsystem. Per Bronfenbrenner (1979, 1994), the microsystem is made up of the person-to-person engagement that an individual experiences in their immediate environment. These interactions, and the relationships associated with them, hold tremendous sway through encouraging or discouraging an individual’s behaviors. There is a deep body of research examining the influence of relational patterns on human development and psychological functioning (Bronfenbrenner, 1994). It is within our relationships that we learn whether it is safe or unsafe to be unguarded and authentic in our environment (Ainsworth, Bell, & Stayton, 1972; Miller, 1986). As such, variables in the micro-level are of utmost importance when assessing, conceptualizing, and working with clients who have lost a pregnancy. Counselors should be aware that some clients do not tell anyone about the pregnancy, tell only a select few people in their microsystem, or share the news more broadly. Although women experience more support when loss is public (Betz & Thorngren, 2006), many are dissatisfied and distressed by others’ response to their loss (Geller et al., 2010; Randolph et al., 2015). Medical professionals may inadvertently minimize the experience (deMontigny et al., 2017; Geller et al., 2010). They and others in the client’s microsystem may project their own emotional reactions (e.g., grief, relief) or processes (e.g., minimization, spiritual bypass) onto the client. Over the last 2 months, there has been much clinically noteworthy activity within Michelle’s microsystem. There were marked shifts in her relationship with her romantic partner: a growing intimacy with energy focused on a long-term future together, followed by a distancing that includes new behavior patterns that did not exist before her pregnancy. Though she reports closeness with her parents, she has chosen not to disclose news of her pregnancy or miscarriage to them because of her predictions regarding their reaction, suggesting a current lack of transparency in relationships that had previously been a source of support. Michelle reports a perceived lack of empathy from her close friends, who do not understand her response to the miscarriage. Similarly, her experience of pain during her surgery was not the response predicted by her physician. Michelle’s sense of disconnection in her microsystem may be related to feelings of shame. Shame is a documented reaction to losing a pregnancy (Bardos et al., 2015). Women may feel ashamed that their body did not carry the pregnancy to term or that they are responding differently than they imagine others have responded to such a loss. Shame has been described as a sense of unworthiness to be in authentic connection with others, based upon previous experiences of disconnection or hurt in relationships (Miller, 1986), such as those that Michelle has recently experienced. Her growing sense of isolation within her microsystem is of utmost clinical importance. Her request for an older woman therapist can be understood as evidence of her resilience and ability to care for herself—she is seeking to enrich her microsystem via connection with a new person who is more likely to be empathic and validating than those currently within this sphere. Mesosystem. The mesosystem is the system of microsystems in an individual’s life, describing interactions between environments (Bronfenbrenner 1979, 1994). Michelle describes her relationship with her parents as close, but the interactions between the system she currently lives in (Michelle and her boyfriend) and her family of origin are not without tension. She reports that her parents disapprove of her living with Jon. Based upon this, she has not told them about her pregnancy or miscarriage. Is this an example of healthy boundaries between the couple and Michelle’s parents, or are there other aspects of this system-to-system relationship in which Michelle feels torn between the norms of one system versus the other? Questions also arise regarding the communication with and between her medical providers. Her physician minimized her concerns, and his prediction about the amount of pain she would experience during the procedure proved inaccurate. Assuming the surgical center has greater knowledge about the variability of patient responses to such procedures, could better channels of communication between the center and offices of referring physicians promote increased patient understanding regarding what they might expect? Was Michelle’s doctor aware of her history of anxiety, and was this communicated to the surgical center? If so, in what way? An ecologically informed counselor might request permission to facilitate communication between Michelle’s health care providers, so as to best serve the client and to model how advocating for such interactions might be helpful to her in the future. Exosystem. Bronfenbrenner’s exosystem (1979, 1994) is similar to the mesosystem in that it describes interactions between two or more environments, except that the individual of interest is not present in at least one of them. This construct captures how a setting or system can have observable influence over an individual’s experience, even though a person may not ever have direct contact with it. There are multiple exosystem variables evident in Michelle’s story at intake, and more would likely emerge during the course of clinical work. For example, her current economic challenges are having a profound effect on her well-being. Michelle’s removal from her parents’ health insurance plan, her medical providers’ fees for services, and her employer’s guidelines (backed by federal and state law) regarding lack of health insurance and medical leave options for hourly employees are all examples of how the policies and actions of a seemingly distant entity can have profound consequences for an individual. It is possible that Michelle’s physician did not receive specific training regarding communication with patients about miscarriage (Marko et al., 2015). In the absence of training and protocols that acknowledge the great variability in women’s responses to pregnancy loss, including the individual variables that influence reactions and preferences for the type of care received, medical providers may make incorrect assumptions regarding their patients’ needs and experiences. Furthermore, given the current economics of the U.S. health care system, even those providers who might like to offer a more patient-centered approach to care are pressed for both time and resources. In Michelle’s case, the information she received from her physician was likely informed by his training and the norms of the clinic where he is employed, but she experienced more physical pain during her procedure than she had been told to anticipate, exacerbating her feelings of fear and powerlessness. Michelle is an uninsured patient who has experienced both an unplanned pregnancy and an unexpected loss; the medical organizations that have been involved in her care have not expressed awareness or concern regarding the health ramifications of their fiscal policies and procedures, a common practice in the U.S. health care system (Ubel et al., 2013). Michelle’s current distress is largely focused on her fears around her growing medical debt, which she conceptualizes as a problem that is hers alone. Sharing an ecologically informed conceptualization of this issue during the course of counseling, including the complex influence of systems on her current situation, may help broaden her view regarding both her level of personal responsibility and possible avenues for solving the problem. For instance, she may recognize that the billing department’s processes are likely automatic and choose to contact them (thus bringing them into her microsystem) in order to explain her situation and inquire about manageable payment plans and possible bill adjustments for uninsured patients. Macrosystem. The macrosystem encompasses the societal context in which an individual exists, including elements such as laws, economics, and social norms (Bronfenbrenner 1979, 1994). The cultural environment is rich with variables that affect intra- and interpersonal experiences, and the macrosystem can hold much influence over how situations in a person’s life are understood and acted upon—even though individuals may not be aware of its effect. There are multiple influential macrosystem-level factors at play in Michelle’s situation. The cultural taboo around miscarriage—including the lack of general knowledge around causes and prevalence (Bardos et al., 2015) and the lack of traditional behaviors for both women experiencing miscarriage and those whom they tell about the loss (Trepal et al., 2005)—are woven throughout her story. Jon’s need for distance in their relationship may be a manifestation of a number of macro-level factors, including the taboo around the topic and the more general cultural expectations regarding masculine avoidance of painful emotions and the imperative for men to disguise a lack of knowing what to do in a given situation. Religion, another pervasive cultural force, influences Michelle’s parents’ conceptualization of her decision to live with her romantic partner, thus affecting microsystem relationships and the mesosystem interactions between those systems. Religious and other deeply held personal beliefs (e.g., how miscarriage should be addressed—or not addressed—per the norms of a specific culture) were likely at play in many of the interactions Michelle has experienced since the loss of her pregnancy. Michelle’s removal from her parents’ health insurance plan upon turning 27 is deeply influential; this occurrence is one based upon laws that were enacted amidst a complex economic and political environment. Through a systemic lens, the quality and cost of her health care without insurance, as well as the cost of her upcoming graduate education, can be conceptualized not merely as facts, but rather as products of a dynamic and complex ecology. In this way, Michelle’s difficulties are not hers alone, but those of a much larger system. When ecologically framed, questions arise regarding the expectation that an individual should or even could be able to grapple with such situations in a vacuum. Through this lens, her economic anxiety may be seen as a normative and appropriate response, rather than as a symptom to overcome. In Michelle’s case, the minimization of her miscarriage—including her doctor’s incorrect predictions about her pain level and a lack of assessment related to her emotional response to her pregnancy loss and related procedures—seems to have exacerbated her distress. Michelle may have benefited from expressed empathy and discussion both normalizing and educating her about the wide variety of biopsychosocial reactions to miscarriage (e.g., pain, relief, grief, guilt, anxiety, depression, trauma), as well as a collaborative conversation about her choices and the risks and benefits of her options, including costs. The lack of such discussions stems at least in part from macrosystem-level sexism that silently minimizes women’s experiences, thus placing the responsibility for the distress on the individual rather than spreading it throughout the system. Chronosystem. The chronosystem in Bronfenbrenner’s (1994) ecological systems theory captures the role of time within environments. Specific events and developmental transitions that occur over the course of an individual’s life span and the parallel unfolding of sociocultural history are included in this level. Women’s personal histories of trauma, previous pregnancy losses, and concerns about future fertility (Engelhard, 2004; Shreffler et al., 2011) are significant variables identified in the miscarriage literature that may be understood more deeply when placed within the time-dependent chronosphere. For Michelle, her pregnancy and subsequent miscarriage occurred at a time in her life when her focus was on plans for furthering her education, not on having children. However, she quickly found herself developing a new facet of her identity—that of a future mother. This unexpected life span event may have triggered changes in her concept of self, including her assumptions about how, when, and if she might become a parent. This transition, followed by the existentially activating event of the miscarriage, has caused Michelle to question many other of her previous assumptions; she feels unable to simply return to her original plans. Michelle’s personal experience is unfolding during a time of burgeoning national awareness regarding multiple areas of instability and injustice in our culture. Specific to Michelle at this point in both her individual life and in history are concerns about the present and future as related to economics (medical bills, upcoming costs of graduate school), health care (availability, quality, cost; her chosen future career in the health care field), and gender (her experiences of becoming pregnant, miscarrying, and exploring what it might mean to become a mother; awareness of how sexism and gender stereotypes may have influenced these experiences). An ecologically attuned counselor can utilize the construct of the chronosystem to highlight Michelle’s development as a person within the context of historic developments. Framing of her self-concerns (e.g., debt, lack of empathic responses) alongside societal-level concerns (e.g., economic instability, hostile and benevolent sexism) suggests a universality in her individual experiences and offers an explanation for the depth of her responses—her problems are not just significant within the arc of her own life, but are examples of significant events within the arc of history as well. Miscarriage is a highly common life span event that is shrouded by misinformation and silence regarding its prevalence, causes, and associated outcomes (Bardos et al., 2015; Wallace et al., 2010). This opacity also is evidenced in the paucity of counseling scholarship that includes mention of miscarriage, much of which focuses on the early loss of a pregnancy as a challenge experienced by heterosexual couples en route to parenthood (Sperry & Sperry, 2004; Stark et al., 2011; Wagner et al., 2018). Women’s reactions to miscarriage are varied and unique, influenced by a multitude of variables (deMontigny et al., 2017; Engelhard, 2004; Engelhard et al., 2001; Shreffler et al., 2011). Some women experience clinically significant and persistent psychological distress subsequent to miscarriage (deMontigny et al., 2017; Hutti et al., 2018). Dissatisfaction with health care among women is widely reported, and research indicates a need for improved biopsychosocial care for women after miscarriage, which would fulfill women’s stated needs regarding acknowledgment, validation, education, and resources (Geller et al., 2010). The necessity of system-to-system communication between medical and mental health services, as well as for emotional support provided by clinicians who have knowledge of the complex potential ramifications of miscarriage, is evident. Such care could improve outcomes for many women, particularly those who are vulnerable to clinically severe and persistent distress. Counselors’ education, theoretical leanings, cultural beliefs, and personal experiences influence their understanding of clients. A lack of both societal norms and clinical training regarding helpful ways to intervene with women who have experienced miscarriage may lead to challenges for clinicians. Clients with a history of miscarriage may or may not view the experience as important in their own story, but—particularly given the documented prevalence of silence, distress, and dissatisfaction around responses to this common life span event (Randolph et al., 2015; Trepal, 2005)—its possible clinical salience for individual clients warrants both inclusion in standard counseling assessments and therapeutic attention, according to the goals and needs of the client. It is important for counselors to: (a) be aware of the possibility of serious and persistent distress related to miscarriage; (b) thoroughly assess clients around this topic, despite cultural norms of not mentioning or minimizing pregnancy loss; and (c) have knowledge of the myriad of risk and protective factors around this issue, as well as recommended strategies for working with such clients. The counseling profession has recognized that advocacy to diminish systemic impediments to our clients’ growth is an ethical and clinical imperative (Ratts, Toporek, & Lewis, 2010). 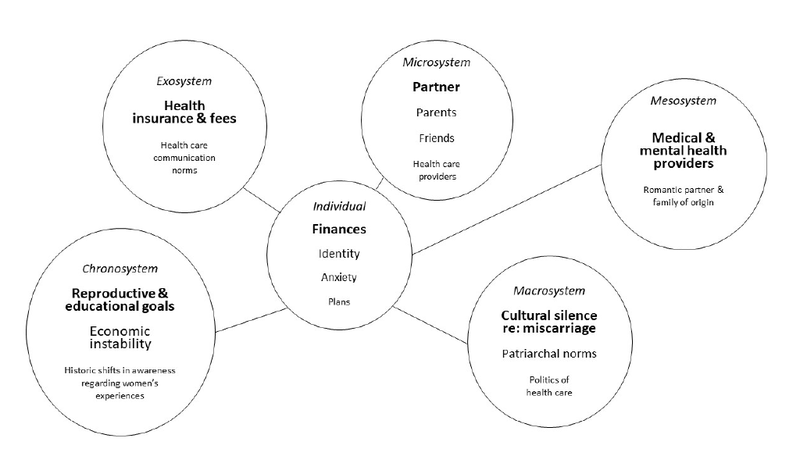 When viewed through an ecological lens, the current literature on pregnancy loss describes the influence not just of individual- and microsystem-level variables (e.g., premorbid anxiety disorder, unsatisfying interactions with medical professionals), but also the influence of distal system interactions (e.g., health care policy, cultural norms). Politics and economics are inherent in health care, both of which are deeply influenced by cultural beliefs and historical context. Awareness of ecological variables when understanding a woman’s reaction to her miscarriage—the attitudes conveyed by the individuals in her immediate sphere, as well as the practices and policies enacted by those outside it—may provide the foundation for a more complex and deeply person-centered approach to counseling. Although the complex definitions of Bronfenbrenner’s levels (1994) may not be of use or interest to many clients, learning to think about oneself and one’s experiences as occurring within a nuanced ecology is a valuable skill. The ability to self-conceptualize ecologically can transfer to multiple domains beyond the counseling office. Counselors may choose to share elements from their ecological conceptualizations with clients directly, both to check in regarding possible salience to the client and to demonstrate systemic thinking as useful cognitive strategy. As people become more aware of the complexity of the systems in which all experiences are embedded, issues related to social justice and advocacy will naturally emerge (Rogers et al., 2018). Ecologically attuned counselors may feel called upon to seize opportunities for systemic-level interventions, using their awareness of complex systems and relational expertise as a foundation for actions that extend beyond their work with individual clients. In turn, as clients experience authentic connection based upon being deeply understood by their counselors, they may reap therapeutic benefits by using their growing awareness of the interplay between experience, relationships, and systems to take action outside the therapy room (Miller, 1986). Miscarriage is a common life span event that can be the impetus for persistent mental health concerns. Distress may be exacerbated by non-supportive cultural norms that are both internalized by the client and systemically manifested. By utilizing established models that account for the influence of variables throughout the environment in which a person exists, counselors are more likely to consider the wide variety of factors that may be affecting an individual client. 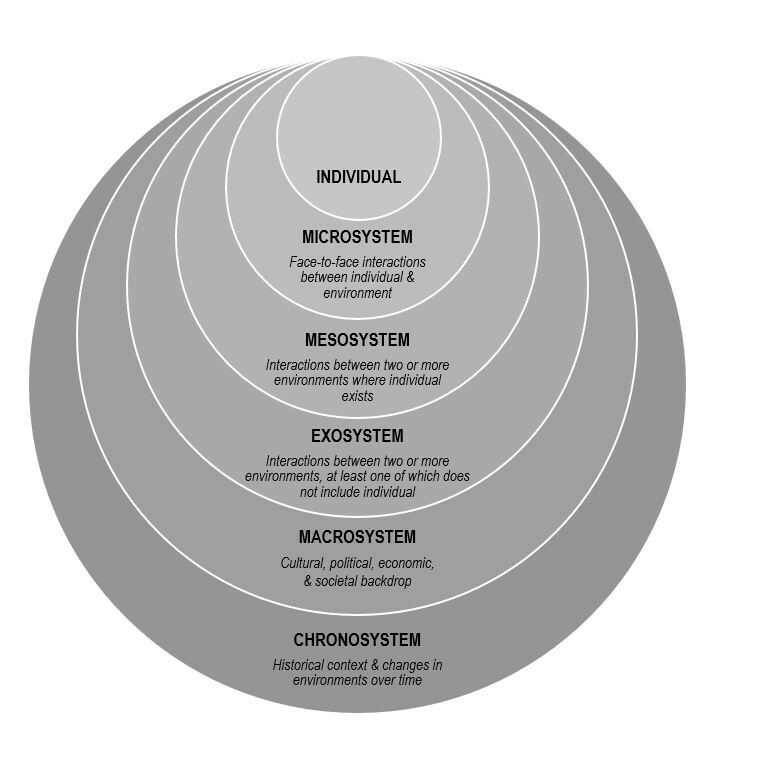 Bronfenbrenner’s bioecological model (1979, 1994) places individuals within complex ecosystems and posits that even interactions between system-level variables not directly connected to a person still influence their experience and development. We propose that an ecological assessment of the variables impacting the client as related to her miscarriage can counter culturally learned avoidance and facilitate complex, nuanced conceptualizations and interventions around the unique biopsychosocial issues that may emerge related to pregnancy loss. Research is needed to further examine women’s experiences of miscarriage and the processes and outcomes of miscarriage-specific counseling interventions. An investigation of the validity and the utility of the proposed conceptual model is just one example of the many areas rich with potential for further inquiry. Future scholarly endeavors on this important topic may ultimately improve awareness, visibility, knowledge, resources, and care for the many women who endure miscarriages during their lifetimes. Ainsworth, M. D. S., Bell, S. M., & Stayton, D. J. (1972). Individual differences in the development of some attachment behaviors. Merrill-Palmer Quarterly of Behavior and Development, 18(2), 123–143. Bronfenbrenner, U. (1994). Ecological models of human development. In M. Gauvain & M. Cole (Eds. ), Readings on the development of children (2nd ed., pp. 37–43). New York, NY: Freeman. Ratts, M. J., Toporek, R. L., & Lewis, J. A. (2010). ACA advocacy competencies: A social justice framework for counselors. Alexandria, VA: American Counseling Association. Trepal, H. C., Semivan, S. G., & Caley-Bruce, M. (2005). Miscarriage: A dream interrupted. Journal of Creativity in Mental Health, 1(3–4), 155–171. Wenzel, A. (2017). Cognitive behavioral therapy for pregnancy loss. Psychotherapy, 54, 400–405. Jennifer L. Rogers, NCC, is an assistant professor at Wake Forest University. Jamie E. Crockett, NCC, is an assistant professor at Wake Forest University. Esther Suess, NCC, is a counselor at the Mood Treatment Center in Winston-Salem, NC. Correspondence can be addressed to Jennifer Rogers, P.O. Box 7406, Winston-Salem, NC 27109, rogersjl@wfu.edu.